Which Antiseptic Wound Disinfectant Will You Pack? 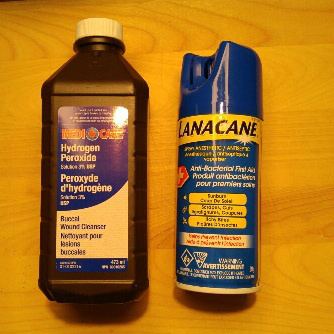 The Hydrogen Peroxide (brown bottle) will disinfect not just wounds, but tools and any surface that needs to be disinfected. You can even soak fruits and veggies in a bowl of water mixed with a capful of hydrogen peroxide in order to make sure that raw food is safe to eat. But hydrogen peroxide does not numb pain. In fact, it stings! (And it is heavier to carry). If you have children or elderly family members and neighbors, then opt for the first aid spray instead. Why? It disinfects wounds, and also numbs pain, and this is GOOD for morale! For babies, first irrigate wounds with sterile saline solution (see further down this section), and then gently use alcohol rubs -- but remember, they sting also! Read all labels CAREFULLY to see if a product can be used safely with babies. If you have room in your First Aid Kit, include both. Or, get an extra rough tote tub for patient care, where you can store the hydrogen peroxide. The tools pictured can be found at medical supply stores. The black handled scissors are used to cut through clothing. They will even cut through jeans. They are a MUST for your first aid kit. Even though the handles are plastic, they went through 12 minutes of boiling with no problems. Tweezers have multiple uses, including removing embedded glass from skin and eyeballs after an earthquake or blast. The shallow plastic box was found at a crafts store. It has a secure clasp closure which keeps it closed--great for a portable first aid kit! This is stored in a fishing tackle box sold at Cabelas Outfitters, 4 boxes are sold as one package. 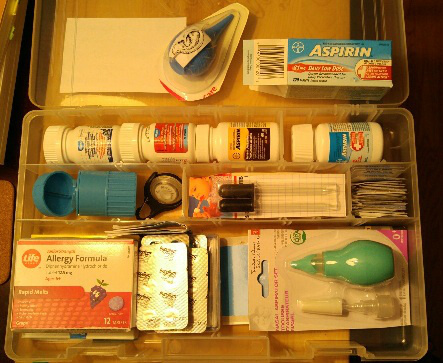 The larger compartment in the front (as wide as the box itself) is ideal for larger first aid items. These boxes each come with extra dividers. THE TOP BOX: For a first examination, we want (clockwise from top right) tongue depressors, a flashlight, nitrile gloves (colors: white, blue or black), tweezers (one with a magnifying glass), tick removers (green), allergy medication (capsules), black handled scissors which can cut through clothing, even thick jeans; rounded scissors, obstetrical wipes (5 in X 7 in -- these can be used for any skin cleaning), alcohol wipes (very small), and glass thermometers in protective cases (1 for babies). NOTICE: The stickers for young children put into a plastic bag taped to the inner lid with packing tape. BOX #2: For wound dressing, there are (clockwise from top right): compress bandages for eyes (here placed against the lid for this photo), larger guaze along back row, narrower gauze, large compress bandages, finger splints in 2 sizes with tensor tape (brown color), and smaller compress bandages (under the scissors). 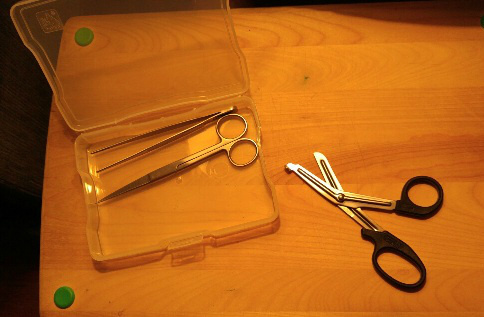 There are both sharp-tipped scissors (to cut compress bandages) and round-tipped scissors to cut tape. The blue roll is first aid tape. Bobby pins have been boiled and dried prior to storing. These may be needed to keep guaze in place if tape does not hold (such as in wet or very cold conditions). A tube of antiseptic cream has now been added. This trauma kit is in a plastic craft box the size of a shoe box. It can hold a lot. ALSO A TOP BOX: Stopping bleeding fast means that people will not go into shock and die. It is really important to stop bleeding. Consider this box a MUST HAVE, and keep it readily accessible and simply labelled "BLEEDING". Clotting sponges (also available at Cabelas) have now been added. Please note, the Sawyer product on the left of the photo does not have clay, and will thus be less likely to result in infection. The clotting sponges may have clay, which means that the wound will have to be cleaned after the bleeding has stopped. Don't think you'll need to stop bleeding? Just think of the prophecy where people are being thrown a distance of 300 steps during the earthquakes that will come. Just think of neighbours and loved ones having to be dug out of fallen buildings. These irrigation bottles will be so important for cleaning wounds, and especially burns! Irrigation of wounds needs a water and salt mixture ( a saline solution) which closely resembles our own body's saline balance. This is 9% (0.9%) saline solution (NaCl). 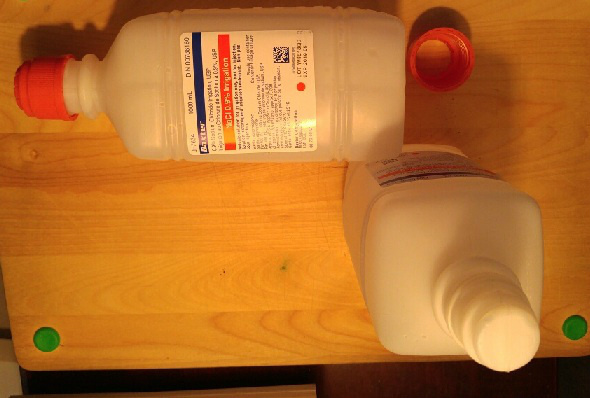 Sterile saline solutions are sold in bottles that either just need the top of the bottle punctured to create that "shower" effect to wash the wounds with, or the inner white cap removed and the orange outer cap replaced (screw on). In an emergency, we need to wash wounds QUICKLY. These bottles do the job. They can be found at medical supply stores. If you have the time and the means to warm this water to no more than body temperature, research shows that using warm saline solution helps to speed up healing. Medical supply stores also sell blue-capped bottles of sterile distilled water. One of these would be ideal for helping people to swallow any medications that you administer (such as allergy capsules). 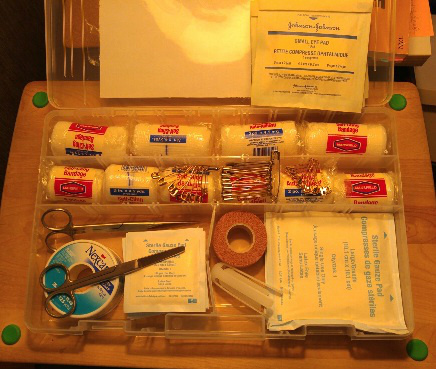 This burn treatment kit has been placed into a craft box made for scrapbooking. Burns need irrigation, a Jelonet medicated bandage, and outer gauze to keep the Jelonet medicated pad in place. These need daily changing, and should be placed on and removed with the aid of long tweezers. This kit will easily fit sideways into your kit, and the locking handle will keep all contents in place. Just remember to clearly label this wonderfully roomy box (which is sold for scrapbooking supplies). 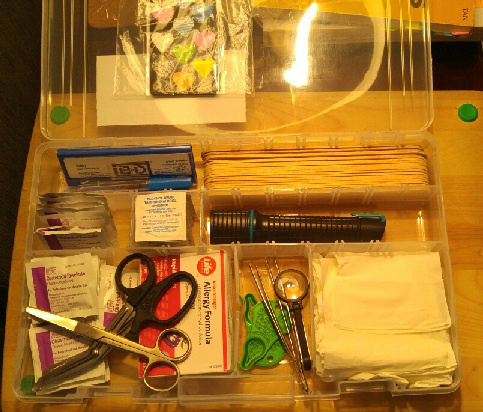 Higher than a tackle box, there is room for an extra layer of a loosely placed elastic bandages and bobby pins (and even diaper pins) that have been placed in this kit. BOX #4: The Baby Care and Medications/Painkiller Box just takes care of the basics. Diarrhea and allergy medications, a pill splitter and crusher (blue), a Moonlight to see with before or after the 3 Days of Darkness (round with black attachment), and extra batteries, Ibuprofen, extra strength asprin, a baby ear irrigation bulb (on the box lid), regular strength asprin and low-dosage asprin, alcohol rubs (very small) for disinfection, eye droppers with and without measurement markings (for giving babies medications), a baby nasal suction kit (green-coloured bulb), and cotton swabs for ears (in a plastic box the size of playing cards). The baby thermometer is in the First Examination Box, but for the sake of convenience, one could also be placed in this kit. Look for old-fashioned glass thermometers, as the digital ones will not work if there is an EMP (an electrical magnetic pulse, which can result from an extra-strong solar flare or a nuclear detonation). Store glass thermometers in their protective cases. Also, put in some soothers or diaper pins in here if you have room. This tackle box also stores the bandaging for blisters on heels. Also available at Cabela's. This box is #4, because these wounds will be less urgent. BOX #4: The Self-Adhesive box needs supplies for years to come for minor cuts, in order to prevent more serious infections from developing. Remember the old saying: "An ounce of prevention is worth a pound of cure." The Polysporin has a short shelf life of one year, and will have to be replaced. 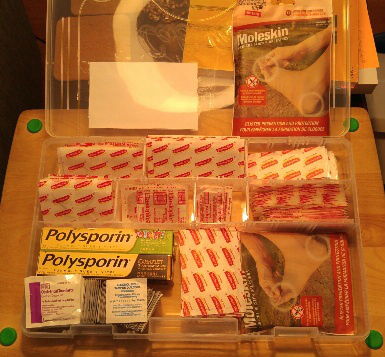 This is box #4, under the pain killers, asprins, and baby care items, because this kit is for less severe wounds. 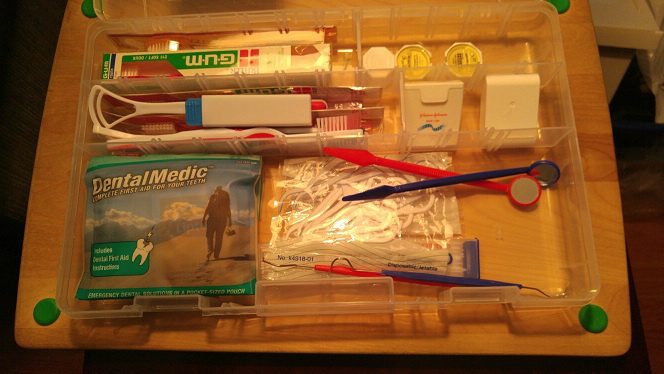 This dental kit is the last box (#5) in the first aid kit. BOX #5: A cavity can be crippling or even deadly. Remember, the brain is just above the upper palate. An infection in the mouth can be lethal. After irrigating the cavity and removing any bits of food, and disinfecting with a mouth rinse of extra-salty water (1 teaspoon of salt dissolved in 1 cup of water), temporary filling material can be used such as "Super-Dent, Cavit, zinc-oxide and eugenol cement or dental wax [softened wax]. 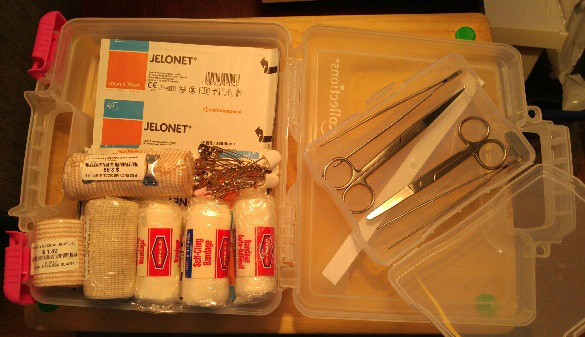 "(Dental Medic Kit, available at www.adventuremedicalkits.com). To do a temporary filling, the "Dental Medic Kit" provides both a generous supply of wax and an 8g tube of Temporary Cavity Filling Material, distributed by Darby Dental Supply, LLC, Jericho NY 11753. This product is made in England. Toothbrushes, dental floss, and a way to do a simple examination will be needed in your Dental Care box. The plastic tools pictured in this photo will need to be replaced with stainless steel tools which can be sterilized through boiling. A portable first aid kit can go with you wherever you go! The cooler would give a surface to work from (its hard top), and even give you a place for your cup of coffee. Pulling or pushing the wheeled cooler would allow you to not exhaust yourself as much as carrying a heavy bag. 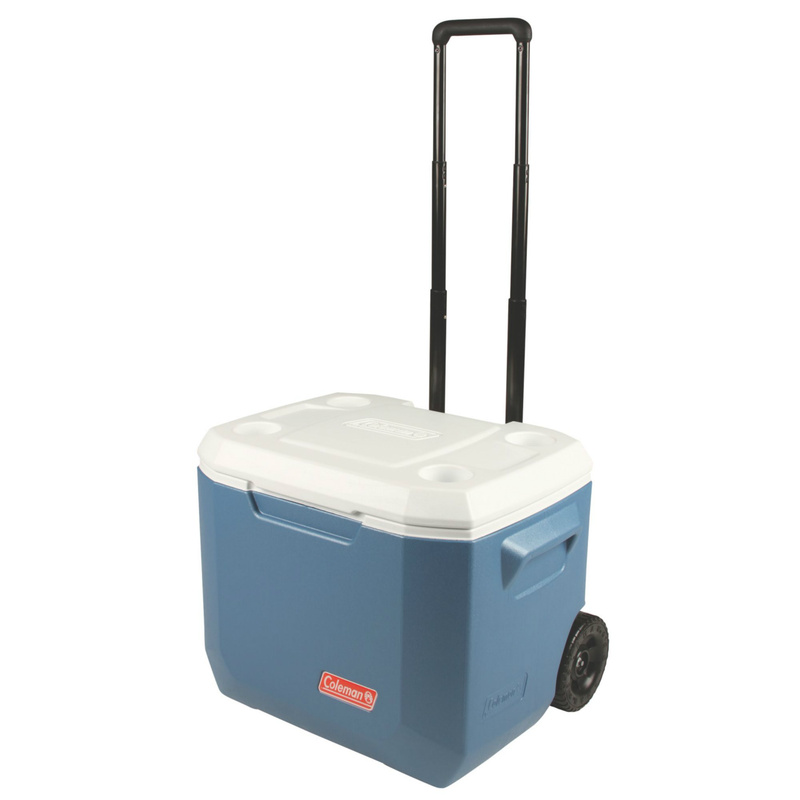 The larger volume of a cooler would allow you to plan for a long-term scenario, such as after the 3 Days of Darkness, by putting in more things, such as specific things for babies, children, and even emergency dental supplies, such as temporary wax for plugging a cavity, as well as plenty of floss and extra toothbrushes. 2. ORGANIZATION: First Aid supplies should be clearly labelled. They should also be stored so that there is minimal "digging" for what is needed. There should not have to be an emptying out of most supplies onto the ground (dirty and germ infested). You do not want to be putting items back inside your First Aid Kit that are now dirty and will contaminate your whole kit with nasty germs. We will therefore need to place items in a top-to-bottom order of care (for a cooler) and left-to-right, or right-to-left, order of care (for a sports bag). Imagine it: We will need to move from an initial assessment of the wound(s), to cleaning and disinfecting wounds, and finally dressing wounds and possibly giving pain killers. 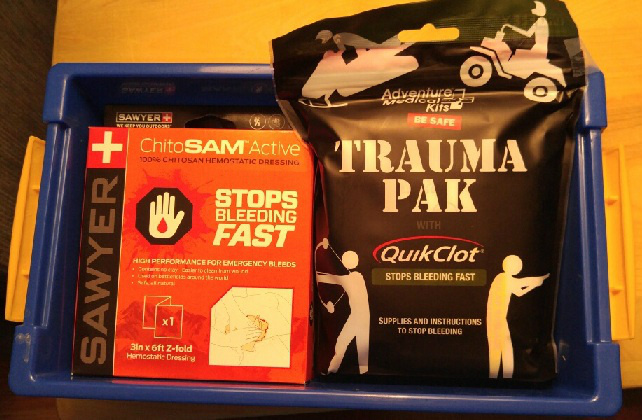 A good First Aid Kit should also have a trauma kit that helps to coagulate blood and stop bleeding fast. An emergency dental kit would also help to stop pain and allow for normal eating/drinking (especially of hot food and fluids). Stores that carry outfitter supplies (hunting, etc) usually carry these two latter kits. precious time will be lost just looking for needed items. an essential, but small, item may be "lost" and not found until much later (when it may be too late). removing unneeded items that are in the way may result in the contamination of these items and of our first aid kits, and even the destruction of certain items (such as the wetting/muddying of compress bandages and gauze). we will become more stressed as care givers, increasing the stress of the injured, which is counter-productive to healing. Think of a cloth diaper, vacuum sealed to keep it fresh, which can be torn into strips to use as a tourniquet, or to hold a compress bandage when the gauze rolls have all been used up. A stainless steel basin which can organize items in smaller zip lock baggies, but which can also be used to boil instruments for sterilization, or to keep suturing needles and thread in a sterile environment during the sewing up of deep cuts. A clean garbage bag can be that clean environment you place your containers into as you move from the top of your cooler to the items at the bottom. Later, when you are done and the First Aid Kit is all put back together, you can fill up the bag with any medical garbage to burn up. Whenever possible, go for stainless steel items rather than plastic items, as stainless steel items can be sterilized and serve for other purposes. Look for creative solutions in places that stock stainless steel, such as cooking stores, hardware stores, etc. Include that baby thermometer along with the adult thermometers, and baby-sized and small child-sized first aid items. Some cute diaper pins in your kit would sure cheer up that new mother who will have to go back to the era of washing diapers by hand! Get some self-adhesive bandages with bright colors or fun animals painted on the outside, and some disinfecting ointment or spray which also numbs the pain. colorful stickers do not take up much room, but they can mean the world to a child. Shattered glass embedded onto eyeballs and exposed skin from earthquakes. Needed: tweezers, all stainless steel. Fractures from being violently thrown about during the earthquakes. Needed: special scissors that cut through even heavy jeans fabric (so as to be able to clean bloody cuts) plus pain killers and a way to secure improvised splints so as to support the injured limbs. Burns from escaping burning wreckages of buildings. Needed: a way to irrigate (for hands-off cleaning), medicate, and dress burn wounds. As well, a way to keep patients warm if they begin to shiver, teeth chattering, as they experience cold due to the severity of their burns. Pain killers. Allergic reactions from eating wild edibles or food that has spoiled. Needed: Benadryl. Vomitting. Needed: the re-balancing of electrolytes by making a salt + sugar + water solution that the patient drinks (2 cups, to be sipped). Diarrhea. 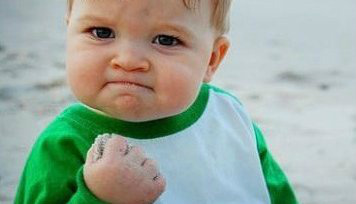 Needed: Anti-diarrhea medication, followed up by the salt + sugar solution to re-balance electrolytes and restore hydration. Coughs and respiratory infections that result from being exposed to the elements, such as sleeping on the cold ground. Needed: Decongestants and possibly a round of anti-biotics, as well as making an elevated bed. Getting army-type cots now, during sales, will be useful later. Include a pair of all stainless steel left-handed scissors, in case God sends you a left-handed doctor or nurse (or vice versa). Maintain a "CAN DO" Attitude! So as not to get overwhelmed, work on small tangible goals, one at a time. Tell yourself: "This Saturday, I will go to X medical supply store and get 2 bottles of saline solution and 2 boxes of nitrile gloves, one in my size and one in a larger size." Or tell yourself, "This weekend I will decide on a duffel bag or cooler for our First Aid Kit, and I will check flyers and buy it." (Walmart has cheap Coleman coolers with wheels and a pull handle).